Two teams working independently have found evidence implicating a geothermal plant in South Korea as a cause of a major earthquake in the city of Pohang last year. 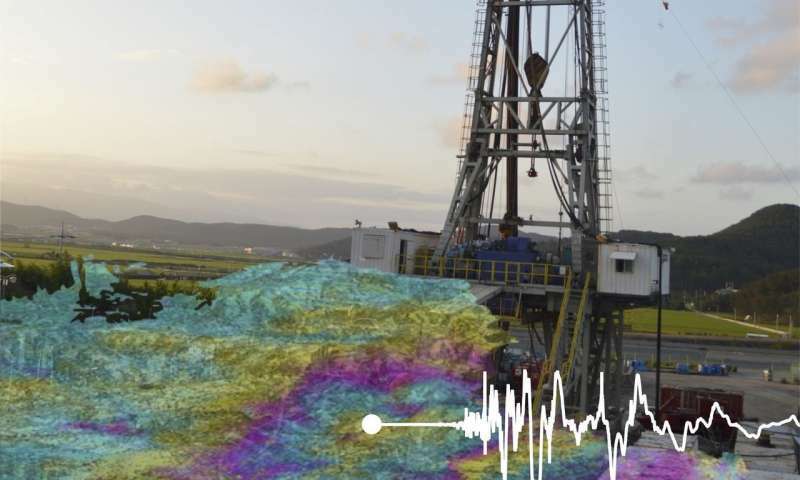 One of the teams, made up of researchers from several universities in Korea, used data from onsite seismic monitors to reach their conclusions. The other team was made up of researchers from across Europe and used satellite data to make their assessments. Both teams have published their findings in the journal Science. Last year, on November 15, a 5.5-magnitude earthquake struck the South Korean city of Pohang, causing structural damage and numerous injurious to citizens. The quake was a surprise to much of the world because the area was not sitting on a known fault line and no earthquake had ever been recorded there. It was not a surprise to the Korean team of researchers, however, who had already observed numerous smaller earthquakes in the area that they suspected were caused by a geothermal plant—the size of the quake, on the other hand, was a major surprise. Because of the smaller quakes, the researchers had installed an array of seismic monitors around the plant. Just five days later, the big quake came. Data from the sensors indicated the earthquake was centered directly below the geothermal plant, strongly suggesting its activities were involved. Geothermal plants such as the one proposed in Pohang (it has since been shut down) involve drilling two holes into the ground and then forcing water down them, causing the ground between them to crack. Once it does, water can be pumped down one hole and extracted from the other hole. The water is heated as it passes through the cracks underground. In most cases, such plants work without problem, but in this case, it appears the water served as a lubricant for an unknown fault. The second team used data from regional seismic monitors and also from satellites to study ground movement. They noted the earlier, smaller earthquakes and the larger one were all centered around the geothermal plant—they also noted that all of the quakes were unusually shallow. Taken together, the evidence suggests that the geothermal plant activities were the cause of the earthquakes. The Mw 5.5 earthquake that struck South Korea in November 2017 was one of the largest and most damaging events in this country over the last century. Its proximity to an Enhanced Geothermal Systems site, where high pressure hydraulic injection had been performed during the previous two years, raises the possibility that this earthquake was anthropogenic. We have combined seismological and geodetic analyses to characterize the mainshock and its largest aftershocks, constrain the geometry of this seismic sequence and shed light on its casual factors. According to our analysis it seems plausible that the occurrence of this earthquake was influenced by these industrial activities. Finally we found that the earthquake transferred static stress to larger nearby faults, potentially increasing the seismic hazard in the area. The Mw 5.4 Pohang earthquake, the most damaging event in South Korea since instrumental seismic observation began in 1905, occurred beneath the Pohang geothermal power plant in 2017. 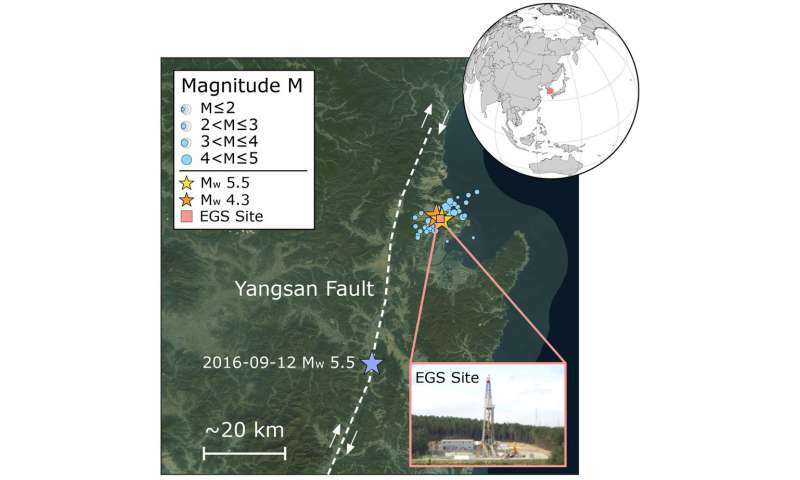 Geological and geophysical data suggest that the Pohang earthquake was induced by fluid from an enhanced geothermal system (EGS) site, which was injected directly into a near-critically-stressed subsurface fault zone. The magnitude of the mainshock makes it the largest known induced earthquake at an EGS site.